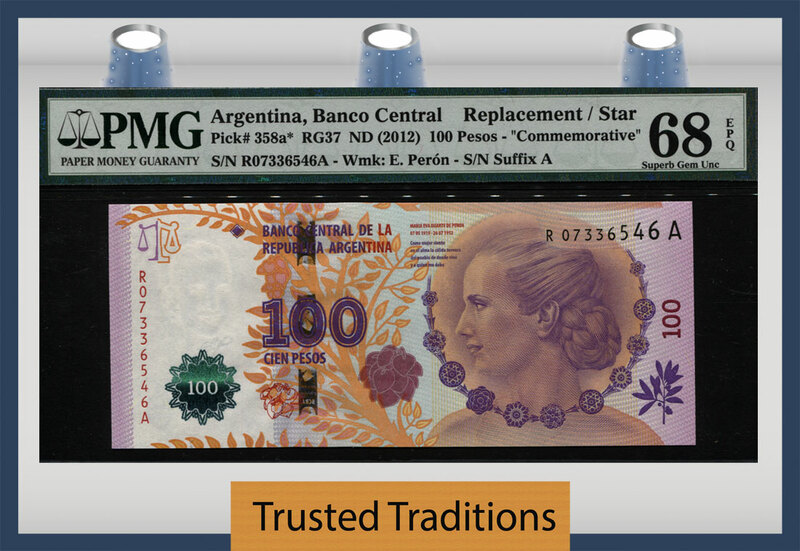 TT PK 358a* 2012 ARGENTINA 100 PESOS EVITA PERON COMMEMORATIVE REPLACEMENT/STAR PMG 68 EPQ SUPERB GEM UNCIRCULATED! TT PK 277 1967-69 ARGENTINA 100 PESOS "MAN'S HEAD" PMG 64 CHOICE UNCIRCULATED! 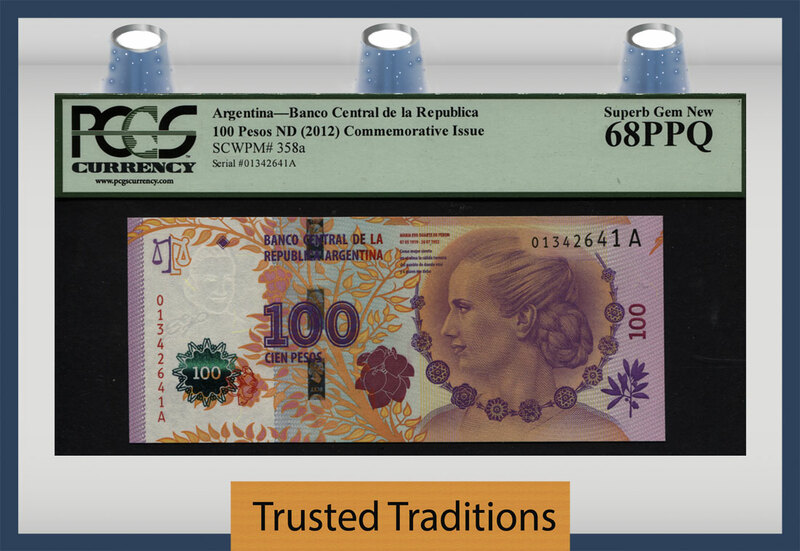 TT PK 281b 1961-69 ARGENTINA 10000 PESOS "SAN MARTIN" PCGS 65 PPQ GEM NEW! TT PK 289 1970-73 ARGENTINA 10 PESOS PMG 66 EPQ GEM POP ONE FINEST KNOWN! TT PK 293 1974 ARGENTINA 1 PESO "MANUEL BELGRANO" PMG 67 EPQ SUPERB GEM UNC! TT PK 296 1974-75 ARGENTINA 50 PESOS PMG 66 EPQ GEM POP ONE FINEST KNOWN! 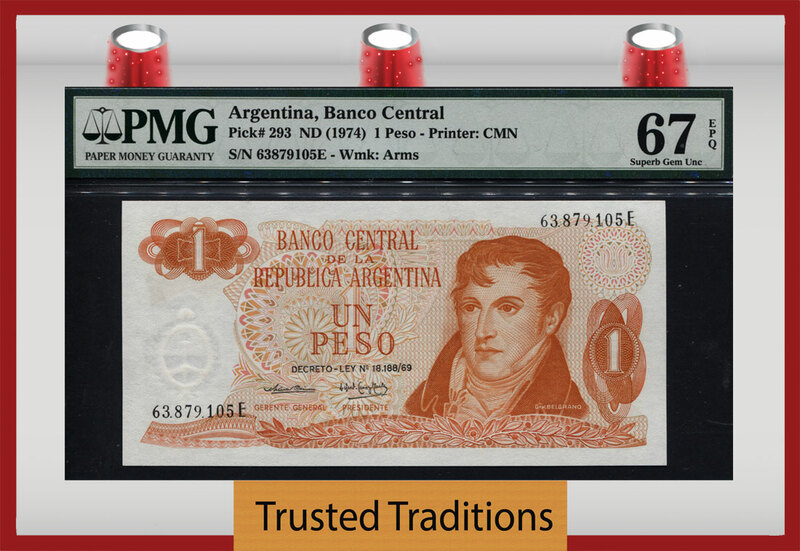 TT PK 301a 1976-78 ARGENTINA 50 PESOS PCGS 67 PPQ SUPERB TOP POP FINEST KNOWN! TT PK 301b 1976-78 ARGENTINA 50 PESOS PMG 68 EPQ SUPERB GEM UNC FINEST KNOWN! TT PK 311a 1983-84 ARGENTINA 1 PESO ARGENTINO PMG 65 EPQ POP 1 FINEST KNOWN! TT PK 311a 1983-84 ARGENTINA 1 PESO ARGENTINO PMG 67 EPQ POP ONE FINEST KNOWN! 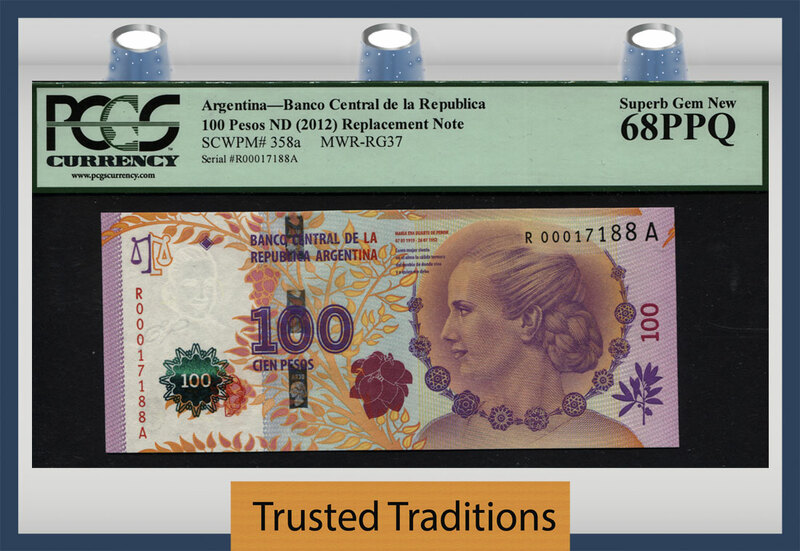 TT PK 317a* 1983 ARGENTINA 1000 PESOS "SAN MARTIN" PMG 65 EPQ GEM POP 1! TT PK 328a* 1988-90 ARGENTINA 500 AUSTRALES PMG 65 EPQ GEM NONE FINER!